It has now been exactly four weeks since it snowed the last time in the Alps! Today and hopefully the following days, will bring the eagerly awaited reset – at least a fresh topping in the high mountains. I have not yet given up the season, but what a strange season it was! Loads of snow, rain, wind, and warmth. The hottest April ever! How can you not like those mountains? Still, some of the most motivated and keenest skiers managed to make it a truly memorable ski-month. Crazy lines got skied including the first ski descend and first snowboard repetition of the Triolet NF …just 23 years after the opening by snowboard legends Dédé Rhem and Jérôme Ruby. Despite all that, April conditions have been widely seen as challenging, coming up with many close calls and accidents. I left town earlier than originally intended. After a couple of consecutive days with bad luck and scary moments with lucky outcome, I decided not to return until conditions improve significantly. Meaning no Foehn, moderate temperatures and fresh snow. I know that patience will pay off. Maybe it won’t happen this season anymore, but it will in future for sure. It is that same patience that already rewarded us after that last four weeks old snowfall I mentioned in the beginning. After skiing in Italy we got another fine dump that reached the Chamonix side of the Mont Blanc massif 🙂 ! Knowing that post snowfall chances for an early opening of the Midi lift tend to zero, we all met at the station before 7:30. A single mountain guide was the only person already waiting there. At 7:30 the first employees arrived. The next skier who showed up was Seth, followed by Nate a couple of minutes later. In the meantime the operator announced an information update at 9:30. Time enough for a handful of locals to gather at the lift as well. When they finally started the lift, it wasn’t much more than 30 skiers taking the first bin up the Midi. At the summit station the view was great, but there wasn’t yet a window through the thick clouds below. The smell of a spliff being smoked told us that obviously nobody was in a hurry 😉 We enjoyed a fantastic morning on the sunny teracces of the summit station. I can’t tell who it was who must have skied in zero visibility, but when the clouds finally cleared it was only Tof with the FWT crew who set off in front of us. They skied the Cosmiques’ Couloir leaving a good looking Glacier Rond for us. After last years experience I wasn’t too upset to see that three people must have been there already earlier the day to check snowpack stability. It is my third year I come to Chamonix and the third time I ski Glacier Rond. It is the only line I skied every season so far. It is not my favorite, and to be honest, it seems to scare me even more every time I come back. However, this time we had the best conditions so far. About 10-20 cm powder on the hanging ice and roughly half a meter in the exit couloir. The exit couloir was never bad -this time it was perfect- and after skiing it I just might have forgotten how nervous I was at the top of the hanging glacier? 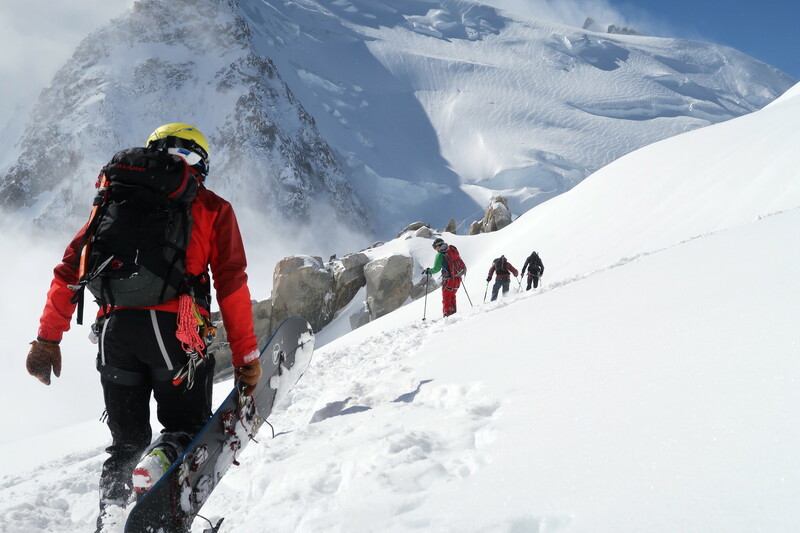 Posted in SkiingTagged Aiguille du Midi, Big Mountain, Chamonix, Chamonix Mont-Blanc, Freeride, freeskiing, Glacier Rond, Midi, Powder, Skiing, steep, Steep skiing, steil, Steilwand, west faceBookmark the permalink.